Legumes convert atmospheric nitrogen into nitrogenous compounds useful to plants. Their root nodules contain the bacteria Rhizobium which fixes free nitrogen for the plants. Beans are a summer crop that do best in full sun and need warm temperatures to grow. Check your soil acidity they prefer a slightly alkaline soil pH level between 6.5 and 7. Bush varieties form erect bushes 20–60 centimetres (7.9–24 in) tall and were developed to not require support – all its pods develop simultaneously so stagger planting times to extend yield times. Pole or running varieties form vines 2–3 meters (6 ft. 7 in–9 ft. 10 in) long and require support. Erect your bean climbing frame, before sowing seeds. Pole beans grow thin tendrils from leaves that will coil around any available support; twine stretched between stakes, along a trellis, fence or up a tepee/ tripod and pods develop gradually over a long season. Beans are an annual plant lasting for one year. In temperate regions sow your pea seeds from February to August, when the soil temperature is above 10°C (50°F). You can soak the pods overnight prior to planting with a pinch of Epsom salts (magnesium) to encourage sprouting. Sow seed at a depth approximately three times the diameter of the seed. Pinching the tips off all new shoots will encourage branching and multiple fruiting stems. Beans can be prone to rot in wet soil, to avoid overwatering sow into damp soil and wait until your seedlings reach 7-10cm tall before watering again. By spacing out plants you allow for better airflow and this reduces potential mildew problems especially during humid weather. Watering your plants with seaweed and worm juice solutions during sunny weather improves their disease resistance. Companion plant Calendula, French marigold, Zinnia and Viola to encourage bees reduce weeds and keep their shallow roots in shade. To avoid damaging the shallow root system of the beans carefully remove weeds or dig by hand. Harvest the navy beans in 9 – 11 weeks when most of the pods are yellow, with a few beginning to turn brown. Unlike snap or green beans, navy beans need to dry on the vine before harvest. Pick the beans regularly to encourage new flowers. For a continuous crop, plant more seed as soon as the previous planting starts to flower. You can eat the young bean leaves and flowers too, they are delicious. Leave some of the pods on the vine until they go brown and the dried peas rattle in the pod, shell and store in a dry, dark place for sowing next season. Choose a different spot for sowing next year and plant nitrogen hungry brassicas in this spot. 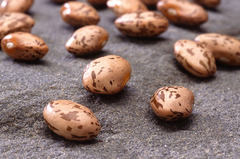 Fresh beans in their pods can be kept in the crisper of the refrigerator for upto two weeks. They are stored at their peak when peeled, then blanched for a minute in simmering water, cooled in the fridge and then frozen. Crimson cranberry beans.